Fantech Dryer Booster Fans solve the problems caused by long duct runs on clothes dryers. How do they work? When the dryer turns on, the fan is activated by the automatic presure sensitive switch so warm, moist air is exhausted out of the house quickly. Suitable for dryer runs with up to a maximum 60 linear feet of 4" rigid duct with six elbows. 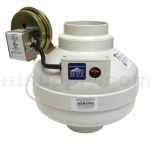 Includes 167 CFM fan, pressure switch, and mounting bracket with hardware. When it comes to dryers, where is the perfect installation with little to no duct length? The reality which contractors and homeowners have to work with is far from perfect. A short dryer duct length is not always possible. This is where Fantech Dryer Boosters can help. Basements that do not allow direct venting. Central interior located residential laundry rooms. Apartment complexes with centrally located laundering areas. Apartment complexes with individual hook-ups for dryers in each apartment. When to boost a dryer. Typical residential dryers are rated at 160cfm. However, boosting is generally needed in order to maintain a minimum airflow of 100cfm as duct length increases and bends are introduced in the duct line. The secret is in the fully automatic pressure switch. Designed to attach inline near the booster fan the switch monitors dryer operation and will activate the fan when the dryer comes on. Preset to cycle in ten minute intervals the fan will stay on until the dryer stops. All Fantech dryer booster fans are suitable for rigid duct runs of up to 60 linear feet with a maximum of six elbows. 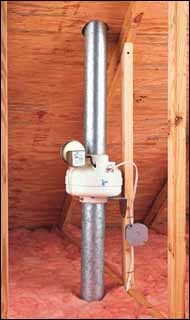 In all installations there needs to be at least 15 linear feet of duct between the booster fan and the dryer.